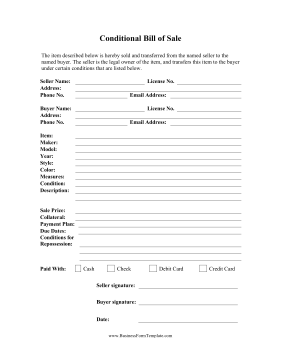 The general product in this free, printable bill of sale is subject to the conditions of the owner or seller, which can be added in alongside the item's specifications. The item described below is hereby sold and transferred from the named seller to the named buyer. The seller is the legal owner of the item, and transfers this item to the buyer under certain conditions that are listed below.